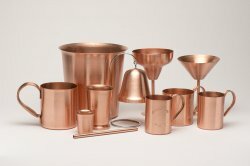 Solid Copper Moscow Mule Mugs. Custom Sizes from our standard 10 oz. up to 18 oz. oversized mug. Now available in 10 oz. - 12 oz - 14 oz. - 16 oz and 18 oz. All solid copper to meet North American safety standards. Various sizes, height, diameter and shapes. Plesae email for the size that you require.